DT Change SIS to Friction? Is there a special tool that's used to switch SIS DT shift option between index & friction? I don't want to break anything so I'm wondering what the proper procedure is to turn the "dial/red arrow pointer" from index to the friction option. It seems stuck in my case. I see there's a tiny hole on one side(11 o'clock position in attached pic) , and another tiny hole with groove the opposite side (can see the groove near the M5 screw). Am I supposed to use a tool to turn it counterclockwise so red arrow currently pointing to "SIS Set" to "Friction Set" ? Thanks! Yeah, looks like you are missing the D ring. Maybe take one off another set of shifters just to help actuate it? You could find somenthing small enough to fit in there. The holes are 180 degrees apart. Small allen keys , circlip pliers etc. But best find a d ring. Yup, just replace that D ring, or see if you can rig up something using a paper clip. That'll let you adjust tension while riding. Keep in mind that friction mode with indexed shifters may not work well. Depends on the design. My Suntour GPX downtube shifter modules have two index modes and one friction. The friction mode doesn't have any clickstops and relies solely on friction between the washers. The problem is finding a balance between good friction feel and retention of the desired position. It tends to creep and ghost shift unless I really crank down the pressure -- in which case it loses any reasonable tactile feedback and I end up missing shifts. It wasn't too bad in friction mode with an old Shimano 600 rear derailleur, but still tended to creep and ghost shift when standing to climb or sprint. I tried it that way for months and finally got tired of it. Switched back to the original Suntour GPX RD and index mode last week. A purpose-designed friction shifter may work better. My other shifters on various hybrids, including a dirt cheap SunRace thumbie set and a Shimano bar-end shifter with index/friction modes, both include clickstops for a better feel and better resistance to creeping and ghost shifting. Kinda thought it was a missing D-ring but wasn't sure. Put an ice pick in the hole and tapped it over to friction. It's 6sp SIS, new 7 speed freewheel, new chain, friction setting now... You guys are correct, shifts as good if not better than 6 indexed. Very cool, thanks again! It's 6sp SIS, new 7 speed freewheel, new chain, friction setting now... You guys are correct, shifts as good if not better than 6 indexed. Very cool, thanks again! If you would prefer 7spd SIS and you have a bike co-op nearby, you can often find a replacement shifter that is indexed to the number of cog you have. Similarly, co-ops are often a good source for reliable friction shifters. as an aside, I still have a 7 spd dt indexed bike that I put on my trainer for winter, and Ive owned teh bike since 90 or 91 and it index shifts as reliably and crisply as it ever did-in other words, it just plain works and so if yours are not working properly, I also suggest finding some old ones as indexing is just plain nice to use. Once in a blue moon I would shift with my bike bottle when I was taking a drink, and could easily use the bottle to tap up a shift. 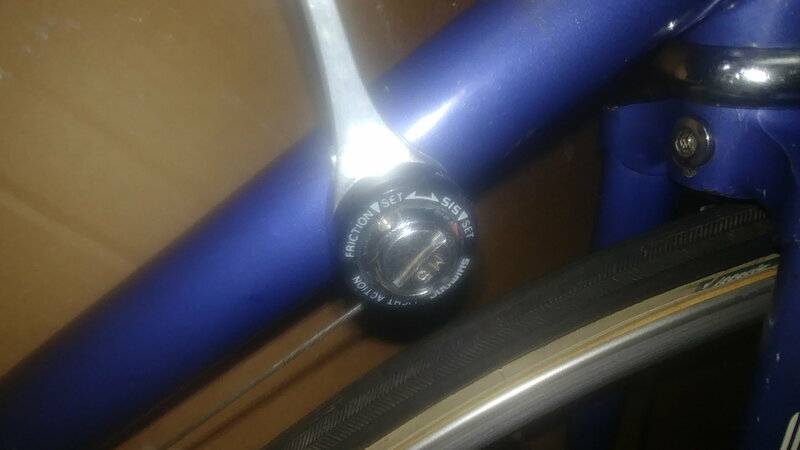 The rest of my bike had deore or deore lx stuff, so without checking, Im sure my shifters were mid level stuff like this, nothing fancy, but even then, given how old this stuff is, you should be able to find some 7 spd index units as give aways somewhere.